Unique in combining the expertise of practitioners from university hospitals and that of academic researchers, this timely monograph presents selected topics catering specifically to the needs and interests of natural scientists and engineers as well as physicians who are concerned with developing nanotechnology-based treatments to improve human health. 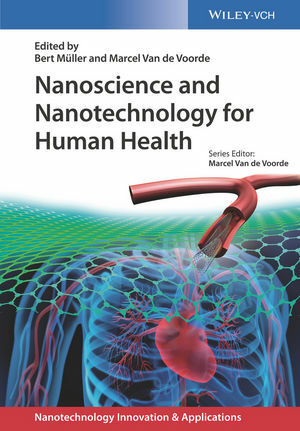 To this end, the book cover the materials aspects of nanomedicine, such as the hierarchical structure of biological materials, the imaging of hard and soft tissues and, in particular, concrete examples of nanotechnology-based approaches in modern medical treatments. The whole is rounded off by a discussion of the opportunities and risks of using nanotechnology and nanomaterials in medicine, backed by case studies taken from real life. Bert Müller is Professor for Materials Science in Medicine at the University of Basel and teaches physics at ETH Zurich. He received a diploma in mechanical engineering, followed by M.Sc. degrees in Physics and English from the Dresden University of Technology, and obtained a PhD in experimental physics from the University of Hannover, Germany. For his achievements he was granted with the Morton M. Traum Award of the American Vacuum Society. Afterwards, he worked as researcher at the Paderborn University, Germany, as Feodor Lynen Fellow and research associate at the EPF Lausanne and as team leader at ETH Zurich. He has become a faculty member of the Physics Department at ETH Zurich. Ten years ago he has founded the Biomaterials Science Center. Currently, this center has more than twenty researchers dealing with nanotechnology-based artificial muscles for incontinence treatment, smart nano-containers to treat cardiovascular diseases, high-resolution X-ray imaging to visualize the human body down to the molecular level, computational sciences of tissues in health and disease and other applications of physics and nanosciences in medicine and dentistry. He is Fellow of SPIE and an active member of the European Academy of Sciences and Arts. Marcel Van de Voorde has 40 years` experience in European Research Organisations including CERN-Geneva, European Commission, with 10 years at the Max Planck Institute in Stuttgart, Germany. For many years, he was involved in research and research strategies, policy and management, especially in European research institutions. He holds a Professorship at the University of Technology in Delft, the Netherlands, as well as multiple visiting professorships in Europe and worldwide. He holds a doctor honoris causa and various honorary Professorships.